Volunteer Coordinator Rob Davies looks back at a year of volunteering at MERL and the Special Collections. Another year, another year of fabulous volunteer projects; 2015 saw a whole host of new volunteer projects and successes. 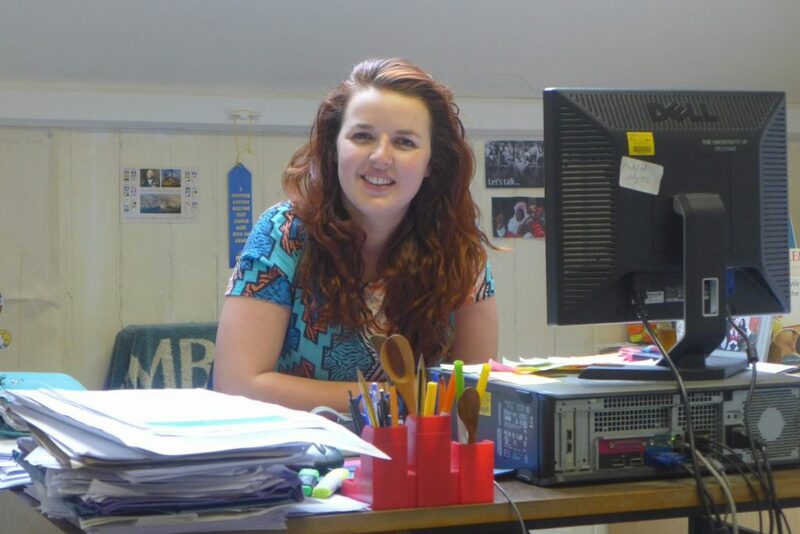 We also benefitted from the new post of Assistant Volunteer Coordinator, Rhiannon Watkinson, who has worked tirelessly with the volunteers. The Our Country Lives Activity Plan has informed the volunteering programme, taking us in new directions with the resources to support new projects. With the museum closed for the redevelopment project, we turned the ceaseless energy of the volunteer tour guides towards the Swing Riots and object handling training projects. (Although some did satisfy their tour guide urges by leading tours around our Victorian building during Heritage Open Days.) As a result of this a new project, our object handling volunteers will be ready for the reopening of the museum, leading handling sessions for visitors to the galleries; Our Swing Riots team are continuing to perform across the county, giving performances at Reading and Wokingham Libraries to name a few. 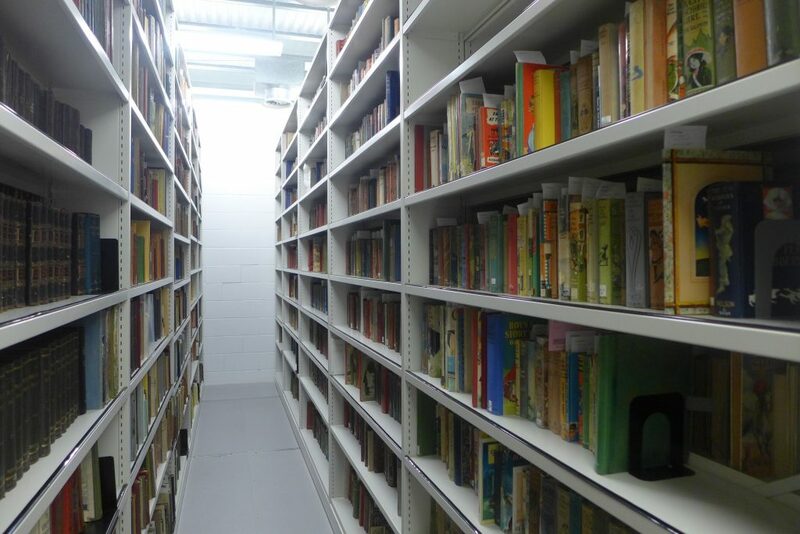 Deep within the archives and libraries volunteers have been quietly beavering away on projects for MERL and the Special Collections, such as Mills and Boon, Landscape Institute, Farmers Weekly. A large project that has included many volunteers is the Nancy Astor indexing project and we are finally nearing the end of the project. Even though the Museum has been closed we’ve continued to host and attend events. Volunteers have been vital to these events. We had a great day at the Big Lunch in the summer on the London Road Campus, the sun was beating down and we were inundated by families all eager to talk to us and have a go at the activities. We couldn’t attend outreach events such as the Berkshire Show, the East Reading Festival or Reading Town Meal, without our volunteers. As well as supporting events, they also lead on some, including the Swing Riots and the recent Our Christmas Traditions event. A young volunteer project has been piloted, with the young volunteers now forming a permanent core of the volunteer team. 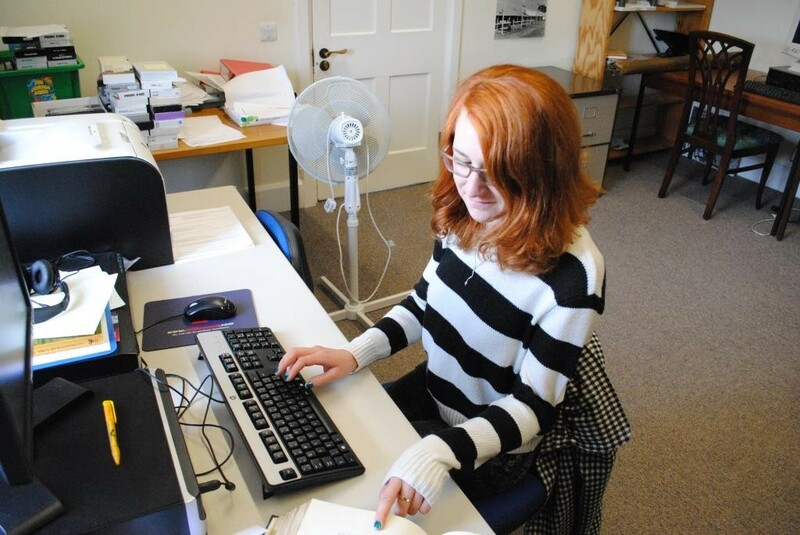 They are aged 14 to 18 and are volunteering on a range of projects from archives to gardening. 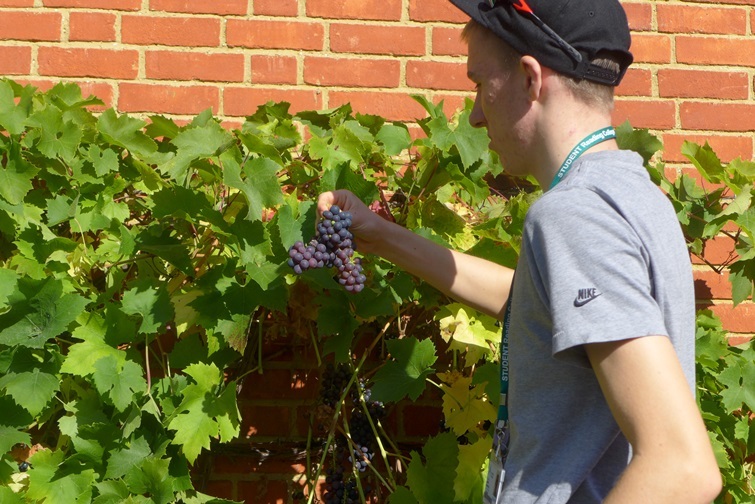 We had a team of volunteers from Reading College tidying up the MERL garden after the builders left, it was great fun and they harvested buckets and buckets of grapes. 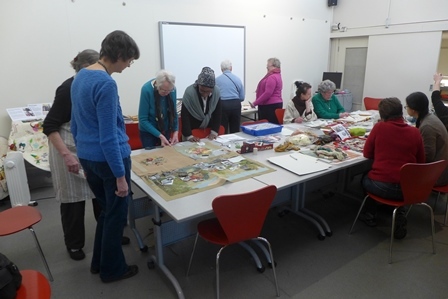 Volunteers have also taken part in the Sew Engaging project which aims to encourage people to think artistically about their relationship with the countryside through tapestry and quilting. Volunteers helped to start the project by preparing packs and making designs; and many have made their own patches. They’ll now be helping us stitch it all together. To say thank you, Rhiannon organised a trip to St Fagan’s in October where we had a private behind the scenes tour and met members of their team. We had a Summer party and a Christmas party, which is always a great opportunity for volunteers across the board to come together. 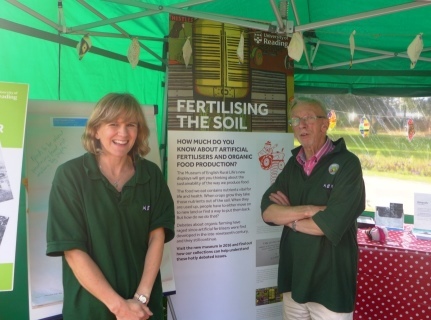 We couldn’t do half of what we do without our wonderful, enthusiastic and dedicated volunteers. I personally think I have the best job in the world because I work with so many different and interesting people. I am looking forward to 2016 with great excitement. 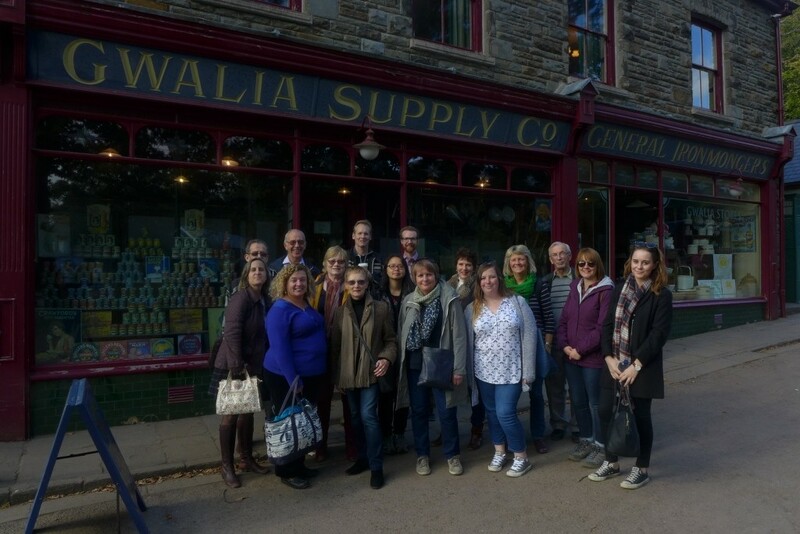 This year we took our volunteers to St Fagans National History Museum, just outside Cardiff, in order to explore hundreds of years of Welsh history. 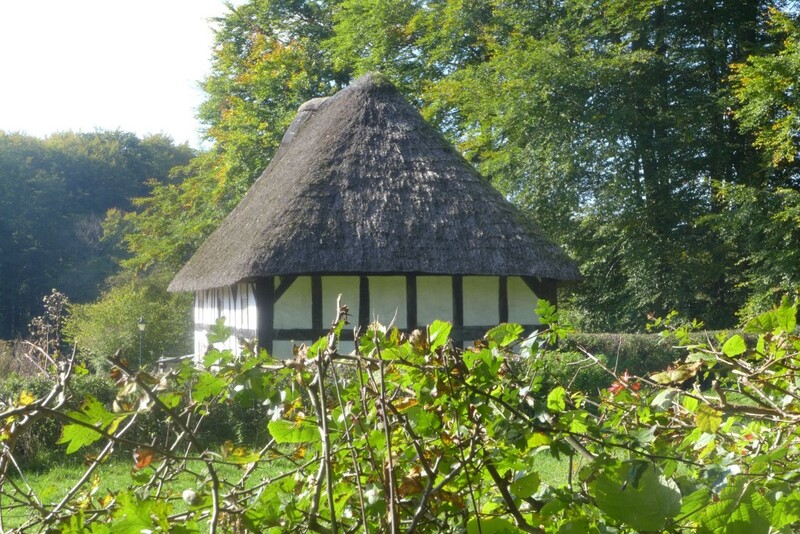 Another reason for choosing to visit St Fagans is that, like us, they are going through a major HLF redevelopment and we thought it would be a great chance to see another museum that is on the same journey as MERL. We headed off nice and early and there was an audible cheer from the almost exclusively Welsh staff members as we crossed over the Severn Bridge! After a slight hiccup with a large coach and a small lane we arrived at St Fagans to be met by Gareth the Senior Curator for Rural Economy. We were extremely lucky to be given a behind-the-scenes tour of one of the museum’s stores by Gareth; taking in amazing furniture such as Eisteddfod chairs, Welsh dressers, and some very impressive harps. Unsurprisingly, the volunteers were very excited about the collection of tools and agricultural equipment in the store; flails, shepherd’s crooks and even a candle making stick all went down a treat with our group and we enjoyed being able to compare St Fagans impressive hoard of tools to our own at MERL. Next for the group came a well-deserved lunch and bit of free time where some of us explored the wonderful Rhyd-y-Car Ironworkers’ Houses which show what home life was like in Merthyr Tydfil from 1805 to 1985. Seeing the gradual change in the houses was absolutely fascinating; moving from the dark interiors of the early homes to the bright pastel décor of one of the 20th Century properties. We were also very taken with an authentic outside loo! After lunch one of Gareth’s colleagues, Daffyd, showed us an aspect of the redevelopment which was hugely exciting: Llys Rhosyr, one of the courts of the Princes of Gwynedd. This court is currently in the process of construction but from the site you could get a real sense of the large scale of the project. Daffyd told us of the plans they have for the new structure as a place where school children can stay overnight and our volunteers have already decided a trip to stay in the court of a Welsh Prince is a must for a future volunteer trip! 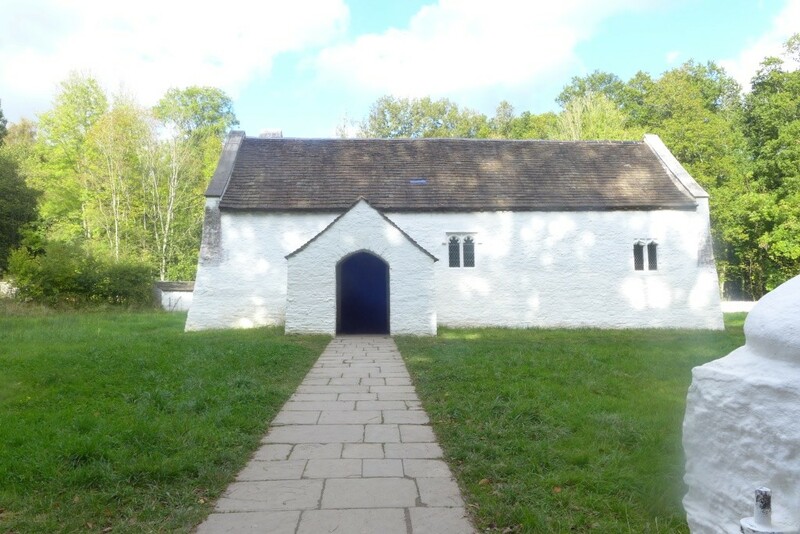 Finally we went to see St Teilo’s Church which was originally erected in stages from around 1100 to 1520 and moved stone by stone to St Fagans over a 20 year period. There were gasps as we entered the church and saw the beautiful paintings that adorn every wall of the building. It was also particularly special as earlier in the day during our visit to the store we saw some of the original wall art which had been removed from the church and is now being conserved. It was a real spectacle and didn’t fail to impress a single one of our group. We all had a fantastic day and can’t recommend St Fagans highly enough. It is so important for all of us at MERL to show how much we appreciate our volunteers and as museums are a shared passion for both volunteers and staff what better way than a trip to one to say thank you. As part of the Our Country Lives Activity plan we have a Young Volunteer’s initiative which aims to encourage young people (14-18) to volunteer at the Museum. We’re working with external partners such as Reading College and Berkshire Youth to achieve this. 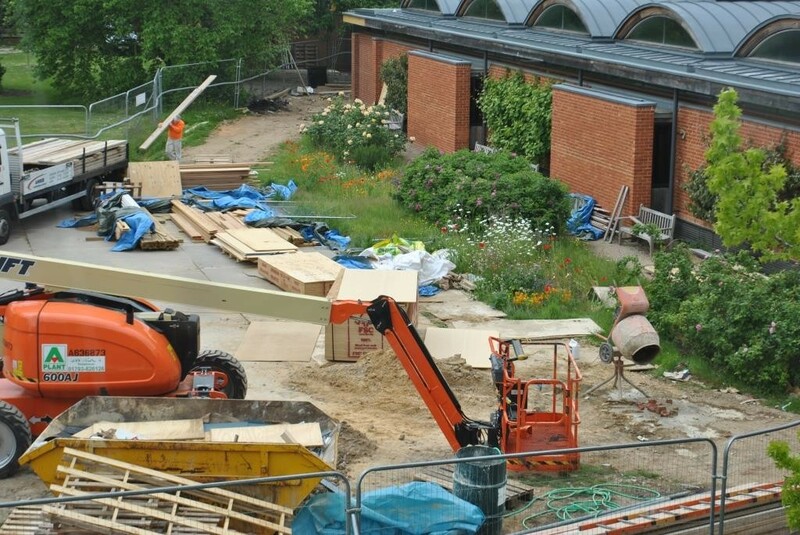 During the exterior building works the garden was turned into a builder’s village! The vines were overgrown, the lavender needed tidying up and the once glorious volunteer-run flowerbeds need to be transformed into allotments. This is where the Reading College students come in. They have set about tidying up our back garden with great enthusiasm. Even though the plans for the back garden have yet to be finalised, we need to make a start with the cleaning up and packing down for winter. We started on Friday 25th September, coinciding with our Macmillan coffee morning. After filling up with tea and cake, the team set to work! Armed with shears, hoes, shovels and wheel barrows the students began. With the assistance of their tutor and my limited horticultural knowledge, our young volunteers did an excellent job. They even harvested our grapes, ready to be turned into juice at the Reading Town Meal. Every Friday until winter sets in the team will be here volunteering in the garden. 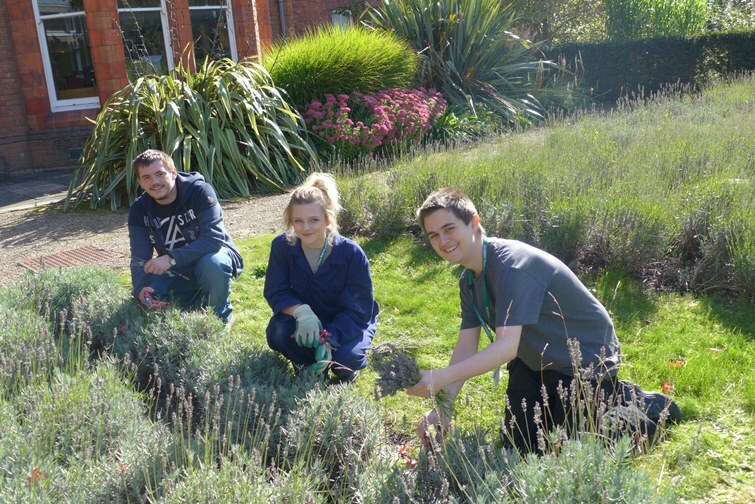 As well as the gardening project with Reading College, we’re working with Berkshire Youth. They’ll be looking at the lives of 19th century children in the countryside and the Swing Riots. Working with our volunteers who developed the Swing Riots performance piece, they’ll be creating walks around Berkshire, based on the routes taken by the Kintbury swing rioters in November 1830. They’ll also put on an exhibition in our community exhibition space. Next year we’ll be recruiting young volunteers (14-18) to be part of the public facing team when we reopen: object handlers, gallery team members, tour guides and front of house members. This will involve after school and holiday volunteering sessions. Four years ago, I moved to Reading. I didn’t know much about the place and didn’t have any friends in the area. I had previously lived and worked in a small, rural, north Bedfordshire village where I knew just about everyone, even just to say hello. So, what does one do to meet people? Look for another job? Well I didn’t really want to start that right away, I wanted to get settled in our new house and support my husband in his new role. Then, maybe look at working again in the future. Our children were away at university, so no meeting mums in the playground, as I have done in the past (we have moved a lot over the years!). I had never had the opportunity of going to university myself, so the institution was somewhat alien to me. What was going on in all of those buildings, and just who were the people working, studying and visiting the campus on a daily basis? Well the only way to find out was to join them. So very early on, I discovered the University had a Museum of English Rural Life. What’s more, it actively involved members of the public in a large volunteer programme. After checking out all the different opportunities that were on offer, there was one that suited me down to the ground – Toddler Time. I had worked with young children for the last decade or more in our village school. I was missing those little people who grow and become the teenagers, students and adults of the future. What a privilege it is to play a small part in their journey. 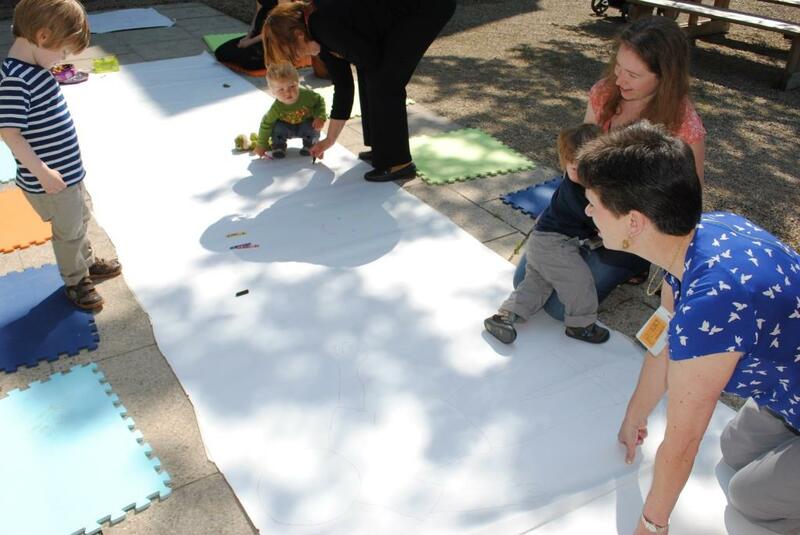 Louise helping some Toddler Time attendees create an extra-large picture! Toddler Time meets once a week in the Museum (although just monthly at the moment, while the redevelopment works are going on) with the aim of introducing youngsters to life in rural England, past and present. We sing some farm or animal songs and then move to a purpose-built studio for a craft-related activity, with something that the children can take home with them. It can be tough getting something suitable for such young children each week but the adults enjoy helping. Volunteering has given me a great insight to the many facets of the University and, in particular, the Museum of English Rural Life. I have learned much and seen the very real passion that the staff have for their work. I have also enjoyed feeling part of the Museum community as a newcomer to the area. Making friends with staff and other volunteers too has been a real privilege. So, come along and get involved! We contributed to different elements regarding the new renovations occurring in the museum. It allowed us to hone our creativity and gave us the valuable opportunity to explore our ideas, for which we are very grateful. This process involved quite a lot of researching and brainstorming, alongside the ability to come to conclusions justified by the evidence in front of us. For example, with the brainstorming for ideas regarding the interactive activities for the new museum where we attempted to enlist as many new means of attracting both demographics; whilst still evaluating whether our ideas will be successful or not. We started our volunteering on January the 13th. We contributed one hour, every Wednesday for 16 weeks. Although we enjoyed the whole volunteering experience, the activity we particularly enjoyed was researching calendar dates relating to rural life as we got to acknowledge different dates such as “Kiss A Farmer Day” we were once not aware of! This volunteering experience gave us a platform to communicate our ideas which improved our interpersonal skills alongside providing us with an opportunity to further our potential. It also adds to our CV! It allowed us to broaden our horizons which hopefully will help us in our future. This week is Volunteers’ Week and we are celebrating the wonderful work done by our volunteers and thanking them for all the hours and effort they put into making the museum the best it can possibly be. 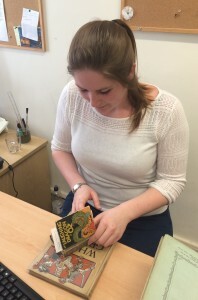 Since November, I have been working with Library Assistant Helen on various different collections and learning a lot through her willingness to answer questions and also her confidence to let me have a go on my own. I have been learning about lots of the different stages of book processing and it’s great to be able to see the books through from delivery to shelf. There is a wide range of collections here and, with my love of theology and literature, I have found much that is very interesting. For the last few weeks I have been downloading and updating records for the Wizard of Oz collection which we are trying to get ready quickly as it’s already in use! I didn’t know that there were so many versions of the Wizard of Oz, some cheaply made with slightly creepy illustrations and others with beautifully drawn imaginative illustration, some pop-up, some film-oriented, and aimed at all different ages. The wonderful thing about volunteering in Special Collections is the sheer diversity in the subjects it is possible to work on. Far from the famous and popular Wizard of Oz, I have also spent some time with the obscure life’s work of Anders Retzius whose beautiful, carefully written and drawn leather-bound book would interest those with a very specific focus on ‘myxine glutinosa’, or ‘hagfish’. One of the Librarians, Liz, has also been giving short lessons on various elements of librarianship, the most recent being on the history of paper which was fascinating and informative, especially for those of us who were unaware of the mysteries of, for example, watermarks. 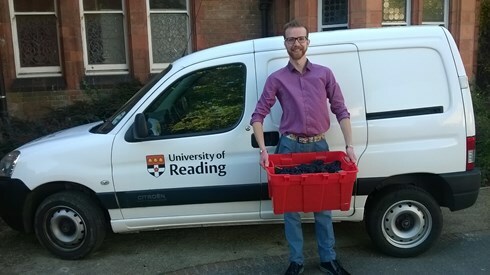 For me, preparing to begin a Graduate Traineeship in Librarianship, working in Reading University’s Special Collections has given me a good introduction to the many facets of a complex career. 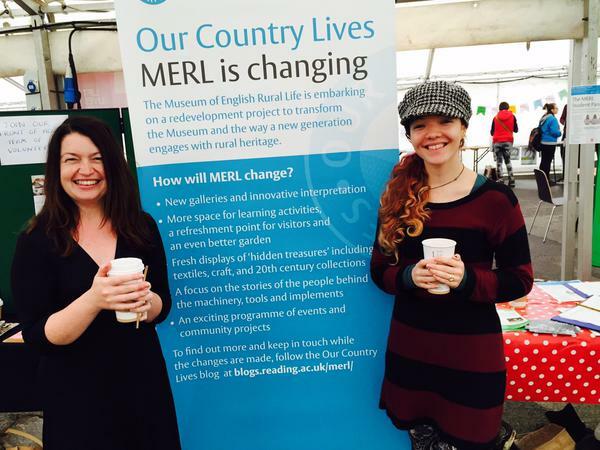 I joined MERL as a Volunteer in 2012 in order to gain some experience in the museum sector. At the time I was studying for my BA and it was MERL that influenced me to study my MFA Fine Art at the University of Reading and I enrolled the following year. The museum has provided many opportunities to assist at one-off events including the annual Village Fete and the Whiteknights Studio Trail. I have also been involved in longer-term projects, including Toddler Time and more recently the Astor Project, which involves cataloguing the records held in the ‘Papers of Nancy Astor‘ archive held in the University’s Special Collections. I spend 2-3 hours each week transferring notes from the index books to an Excel spreadsheet so that the archive, which dates from around the 1930s, will be stored in a digital format for improved access and searching. I’ve enjoyed taking part in this project as it has shown me how the Special Collections Library operates and how valuable documents are filed and preserved properly in the archive store. I am interested in writing so my involvement in the archive has had a positive influence on the art practice that I have developed during my time as an MFA student at the University’s Art Department. All the Volunteers and Staff at MERL have been welcoming and supportive and it’s been great meeting people with similar interests as I continue to work towards an academic career within art. A few months after starting as a volunteer I was offered the opportunity to work on the front desk at the weekend as a Relief Assistant. It’s been fantastic to work directly in the museum with its visitors and to see how much they value the museum as a place to return to regularly. I continue to volunteer at MERL because it is such a great resource and provides many opportunities, but also because it is a place that means something to its whole community. And the cakes aren’t bad either. Let’s start by saying that mine is a particular volunteering experience; I’m actually doing an Erasmus traineeship at the Ure Museum of Greek Archaeology, this means that I’m working at the museum all day every day and I’m doing lots of different things. 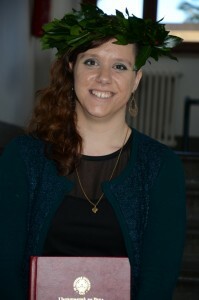 I started my traineeship in the middle of March and I’m going to finish it in June, three months that will give me an idea of what it’s like to work behind the scenes at a museum and of everything I need to know about the inner mechanisms of this particular workplace. As I said I’m at the museum every day, some might think that it may be a bit boring, but that’s far from true! Even if this is a small museum there is never a dull moment and there are many things to do. I help around in any way I can, so I get to spend time with the other volunteers doing archiving or other much needed tasks that are always interesting and sometimes a bit funny, like when we came across some very unusual Christmas cards where instead of reindeers and snowmen there was a drawing of some orientalising style pottery. I also have the opportunity to do some research work and handling ancient objects to try and figure out where, and when, they are from. This is not my first experience as a volunteer; when I was in high school I used to volunteer at the local kindergarten twice a week so it’s no surprise that my favourite task so far was helping around on the school and family events held at the museum! It’s always great to be able to see children being excited about history, mythology and archaeology. They remind me of myself when I was a little kid, enchanted by tales of Heracles or Achilles (to be honest I was also quite smitten by Telemachus). Maybe among the children that I met while volunteering at the Ure there are some that will discover they have a passion for history, art history and archaeology and really, that would be the best reward! Volunteers’ Voice: Celebrating Volunteers Week! At The Museum of English Rural Life we could not function without the hard work and dedication of our amazing volunteers. Around 120 volunteers ensure that the museum not only runs smoothly but is a place full of passion and friendly faces. In the past we have had volunteer tour guides, gardeners, archivists and social media whizzes. We have had volunteers who help with front of house, school sessions, our village fete and in our library. In short, volunteers permeate every aspect of our museum and we are all the better for this. The Museum of English Rural Life is currently closed to the public during our major Heritage Lottery funded redevelopment project which has thrown up new challenges for our volunteers. There is no tour guiding to be done as the collection is packed away for safekeeping and no horticulture to offer as the site of our garden is now occupied by builders! Our beautiful flower beds certainly brighten up the building site, but don’t worry, it’ll all be restored when work is completed in the garden this summer. However, our volunteers have come up with new and unique ways to keep supporting the museum. They have thrown themselves into outreach by taking their play about the Berkshire Swing Riots to local libraries and history societies. They have worked through hours & hours of transcriptions for the archive team. They have even tried their hands at object handling (no pun intended) in preparation for the museum’s reopening. 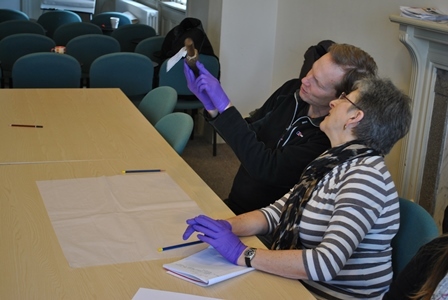 This involved learning how to hold pieces from the museum’s collection, how to facilitate visitors interacting with precious objects and researching a rural topic for an object handling session on everything from bodging to wattle hurdle making.